After submitting the CSR etc, domain control verification etc, I am issued with a zip file containing 4 document which I believe are my issued certificate, intermediate ca certificates and the root certificate. When a browser visit my site (e.g. www.orakoha.com), download my cert and see that it does not have the issuing ca (intermediate ca's public key), will it automatically download those intermediate cert (e.g. COMODORSAAddTrustCA.crt) from my webserver ? or it will prompt the end-user (using the browser) whether he/she wanted to install those certs? 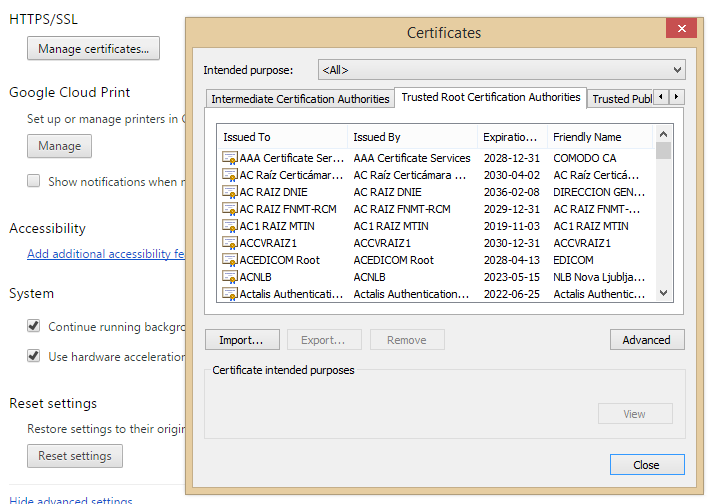 If a browser does not have the root certificate of the root ca issuing the intermediate certs/my cert, what will happen? will my webserver send the root cert over and the browser will prompt whether to install the root cert or not? How do I see what are the root certs that are already installed in the browser? In short: the intermediate certificates have to be sent within the TLS handshake (needs proper configuration of the server) and only the CA local at the client will be considered as trust anchors. ... see that it does not have the issuing ca (intermediate ca's public key), will it automatically download those intermediate cert (e.g. COMODORSAAddTrustCA.crt) from my webserver ? No browser will download the certificate from your site. If intermediate certificates are missing in the TLS handshake some browsers might try to download the certificate from other sites but you should not rely on it. Google Chrome on desktop seems to do it, other browsers not. or it will prompt the end-user (using the browser) whether he/she wanted to install those certs? No, there will be no prompting. Just an error that the certificate cannot be validated. ... will my webserver send the root cert over and the browser will prompt whether to install the root cert or not? No. It would be stupid if a browser would trust any random root certificate send by a server, because then man in the middle attacks would be simple. Even prompting will not help much because most users will just click through any dialog they don't understand. Browsers will only trust the CA shipped with the browser or provided by the OS and explicitly installed CA. Installing a new root is more complex and usually involves that the user explicitly downloads, installs and trusts the CA certificate. There are lots of information about this on the internet. Just follow the links from the search for "view root certificates browser". Note that the actual ways depend on the browser and OS. First, you should read through the most famous question on this site: How does SSL/TLS work?, having a good understanding of TLS will clear up a lot of your questions. a) When a browser visit my site ... will prompt the end-user (using the browser) whether he/she wanted to install those certs? No, visiting a site in a browser will never result in the user installing certs. When you install a cert into your OS's trust store you're saying "I know the origin of this certificate, and I trust it completely". How could I possibly trust a cert that's given to me by some random site that I just visited? How do I know that the cert I've downloaded actually belongs to the site, and not a man-in-the-middle attacker? b) If a browser does not have the root certificate of the root ca issuing the intermediate certs/my cert, what will happen? Simple, the cert will fail to validate and the browser will throw angry warnings. Your certificate trust-store gets filled in with root certificates that have been properly vetted by teams of security experts at Google/Chrome, Mozilla/Firefox, Apple, Microsoft, etc (these are called "pinned certificates"). If a cert was not issued by a trusted root, then it's ... not trusted. Installing a random root cert in order to get around a trusted root is basically the same as disabling your virus scan because it told you that the file you're trying to open contains a virus. These security mechanisms exist for a reason - listen to them! c) How do I see what are the root certs that are already installed in the browser? Not the answer you're looking for? Browse other questions tagged tls certificates web-browser certificate-authority digital-signature or ask your own question. Do I put my subordinate (intermediate) or root CA certificate in my truststore? Can I modify my certificate chain? intermediate cert - to be install on webserver (why)? How does a browser tell the difference between an intermediate cert and an end-entity cert?